Making its debut in 1959, “The Quick Draw McGraw Show” featured a hero with horse sense and his Mexican burro sidekick, Baba Looey. 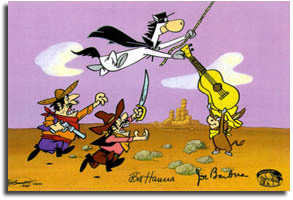 With the then-current Zorro craze, Hanna-Barbera adapted its hero to a mysterious good guy who would smash various banditos with his out-of-tune guitar and a mighty “EL KABONG”. Signed by Bill Hanna and Joe Barbera. Edition Size: 200.